There’s no one more American than Brian Stann! If you’re American or simply looking for a pair of American-themed fight shorts, look no further than the Jaco Resurgence USA shorts that Brian Stann used in UFC 125. The underdog, Brian Stann, shocked the world when he knocked out heavy-hitting stand-up fighter Chris Leben at UFC 125 — and he did it in the Jaco Brian Stann UFC 125 Resurgence USA Fight Shorts. 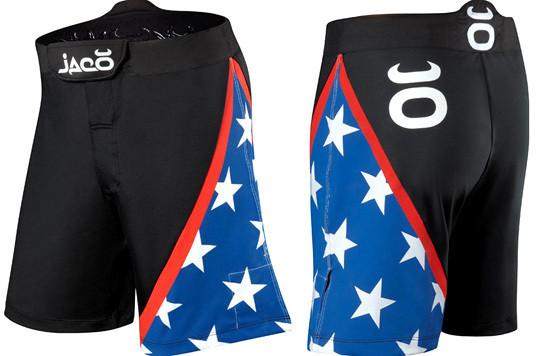 Not only is it patriotic but in my opinion, they are one of the best MMA shorts in the market today! Jaco Brian Stann UFC 125 Resurgence USA Fight Shorts always available at MMAWarehouse.